Most memories are enjoyable, but some still bring pain. This series will not comprise a comprehensive list of all the answers to prayer I have received. Some seem almost too mundane to write about (such as finding a lost contact lens, or being healed from an illness or injury). But there are several more such miraculous moments in my life which stand forth in my mind as a time when God really came through for me, in a way that He alone could do. One such time didn't actually involve prayer, per se, but as you will see, it was miraculous nonetheless. Before we moved to the Pacific Northwest in 1996, I managed rental properties (on a part-time basis) for my father. He owned one home which we had rented to a large family, and it became even larger as extended relatives began to move in. At one point there were at least 10 people living in this three-bedroom house, so it was quite crowded. Most of the time they were what you would call "problem renters" ... paying late (or not at all), or trashing the property. To make matters worse, the head of the household was the pastor of a church in the Pomona area. He and his wife (whom he referred to as the "First Lady") were a quite jovial and likeable pair, despite all the headaches of dealing with them as renters. My "miracle" occurred on an otherwise ordinary weekday afternoon. 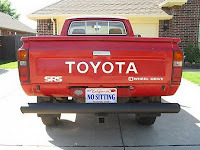 I had driven my small, red Toyota pickup truck to the home to try and collect some rent, and parked face-in to the driveway. While at the door talking with the "First Lady," I was vaguely conscious that there was a new toddler in the household, a child probably only two or maybe three years old who was clinging to her legs. I guessed this was probably a grandchild. But, wading knee-deep in her excuses for not having the rent check, I wasn't paying thorough attention to him. When it came time to leave, I was annoyed and distracted. I walked to the car, climbed in, slammed the door, started the engine, and threw the manual shift into reverse. I was just getting ready to stomp on the pedal and peel out of the driveway, when something happened which I will never be able to fully explain. It was as if a voice exploded inside my head, commanding me: "NO!" As I sat there, stunned and processing what I had just heard, I realized I hadn't actually heard anything at all. I knew that there had been no sound whatsoever. Yet the command reverberated on my nerves. My brain was reeling from the impression that Someone had just ordered me to stop. And not just anyone ... the sense of imperative, the absolutely authority behind that command, was what really had me stunned and startled, as I sat there with the engine running and my foot poised just above the gas pedal. So, moving my trembling foot carefully upon the brake, I took the car out of reverse and into neutral, and pulled the parking brake. I opened the door and got out, engine still running, and walked to the back of the car. That toddler I had last seen in the doorway was now sitting on my rear bumper, smiling up at me mischievously. I felt as if I might swoon and it took me a moment to recover my composure. How close had I come to doing what I had done a thousand times before ... simply throwing the truck into reverse and roaring back down the driveway? Tears began to stream down my face and I plucked up that now-giggling child off my rear bumper. I carried him back to the front door and knocked. The First Lady reappeared, looking very surprised and somewhat annoyed, but not sufficiently concerned ... until she saw my face. I handed him over to her, a cascade of emotions (relief, anger, wonder, and gratitude) flowing down over me as I did so. "I know you believe in God," I said. "You should be thanking Him right now. I know I am." With that, I turned on my heel and left ... this time inspecting the space behind my truck very carefully before I pulled out. I've often wondered, with a chill, how different life might be had I not heard (or not heeded) that Voice. Different not only for me, but for an entire family that probably never had any idea how close we all actually came to tragedy that day. Have you ever heard God speak to you in what was (or was almost) an audible voice? I put a great deal of time, energy, and prayer into responding to these wonderful questions, so it occurred to me recently that I should share some of the better questions (and my responses) with you, here in my blog. Therefore I am going to interrupt my current series on answers to prayer to profile a recent question which came from a brand-new believer in Nepal named Susan. (And please know that I am actually changing the names in order to protect confidentiality/identity.) She asked: "Will Jesus come again in this world? If so, when and how?" I'm so thankful for the great news that you have accepted Jesus as your Lord and Savior! Please visit http://m.godlife.com/look-to-Jesus for your next steps. And I love the question that you asked: Will Jesus return? When and how? The answer to the first question is a very definite YES! Read Matthew 24:30 (Jesus speaking) -- "Then will appear the sign of the Son of Man in heaven. And then all the peoples of the earth will mourn when they see the Son of Man coming on the clouds of heaven, with power and great glory." This verse (and many others -- see also Matt. 26:64, Mark 13:26, Mark 14:62, Acts 1:11, 1 Thess. 4:17, and Rev. 1:7) also reveals HOW He will return ... descending from Heaven, "on the clouds" and in great power and glory! But, nowhere in the Bible does it specify precisely WHEN Christ will return. To the contrary, Matt. 24:36 (among other verses) teaches us: "But about that day or hour no one knows, not even the angels in heaven, nor the Son, but only the Father." The teaching of the Bible is therefore that the return of Christ is "imminent" -- it could happen at any time! Our job as Christ-followers then is to "always be ready" for His imminent return. Which is the entire point of Christ's teaching in Matt. 25:1-13, "The parable of the ten virgins." In this parable, Christ is the bridegroom and we, His Church, are those awaiting His coming. 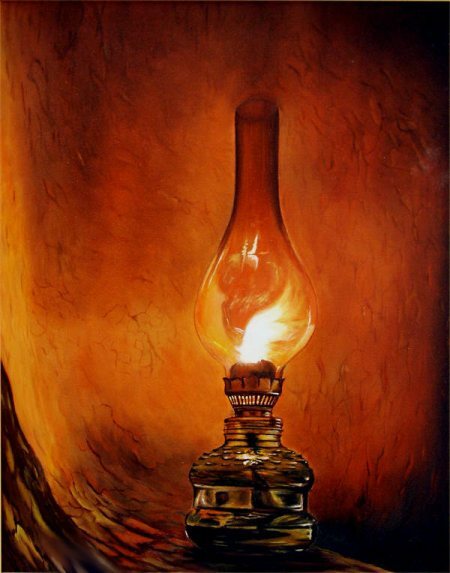 We are to keep our wicks trimmed and lamps ready, full of oil (speaking of the Holy Spirit, always empowering our witness). As a new Christian, the Holy Spirit is available to empower you to help you live the abundant Christian life, in purity and boldness of witness. (See Luke 11:13.) But you need to "fill your lamp with oil" every day. So don't neglect to pray every day and ask to be filled anew with the Holy Spirit! How can I pray for you? Do you have any questions? Please write back. Please check back Monday for the third installment in the "miraculous answers to prayer" series. Does God still perform "signs and wonders" in the present day? I know that is a subject of huge debate between "cessationists" (who believe that signs and wonders were for the purpose of validating the Bible, and now that the Bible is complete, are no longer needed) and "continuationists" (who don't see a reason why God would stop acting now like He acted in biblical times). And I don't want to waste time in a debate like that. But I do want to encourage you with my belief (and my personal experience) that God still answers prayer today, just like He has always done ... and sometimes that answer takes a very miraculous form. In my last two blogs I've shared about how God rescued me, miraculously, from what could have been a very dire outcome of a bad mountainbiking accident; and about how God reached down and touched a Muslim taxi driver in Trinidad, miraculously, giving him a reason to pay close attention to the claims of the Gospel. But sometimes the miracles that make an impact on my life are second-hand. When I was attending college at Biola University I met a young man named Ha Jimmy in 1976. Well, he looked young, but he was probably older than your average college student ... I would guess in his early- to mid-30s at the time. Ha Jimmy had come to Biola through a very circuitous route. He was of the Hmong tribe which inhabited the inland mountains along the eastern edge of Vietnam. The Hmong presented fierce resistance to the encroaching communists in Vietnam, and Ha Jimmy had served as a high-level officer in their forces. It was while he was thus occupied that he encountered someone who shared with him the claims of Christ, and he decided to take the leap and place his trust in the Son of God. Ha Jimmy told me some harrowing tales of the accounts of the Christians in Saigon, in the final days before its fall to the communists. When they knew the end was drawing near, churches began hosting spontaneous nightly prayer meetings. These meetings did not have scheduled end times, as our prayer meetings often do. People would just pray until they felt too tired to continue. During one such prayer meeting, they were all praying and no one really had a sense of how much time had passed, until someone pointed to the east-facing windows and exclaimed "Look!" Dawn was beginning to break outside. They had prayed all night long and weren't even aware of it. Ha Jimmy said that their prayer that night had been particularly sweet. They all felt strangely energized; no one wanted to go home and sleep. So instead, they began going door to door, visiting many of the people in the community around the church. They encountered many sick and wounded. They offered to lay hands on them and pray. They were astonished to discover that, as they prayed, many of the wounded were healed. At one home, he said the door was wide open and the people inside were wailing. They walked in, and saw the body of a young man lying on a bed. The sheets were bloody and the young man was strangely pale and still. They were told that he had just died. Ha Jimmy said the group felt compelled to lay hands on the body, and so they did, to the astonishment of those standing nearby. He said they didn't pray specifically that God would raise the young man from the dead -- they just prayed. Suddenly, they felt him move, and heard him cough. They opened their eyes and saw that the young man was looking at them. His family members cried out and fell to their knees in astonishment. "What should we do?" they cried out. Ha Jimmy said all he could think to tell them were the words of Paul and Silas in Acts 16:31 -- "Believe in the Lord Jesus Christ, and you shall be saved ... you and your entire household." He said the entire family prayed to receive Christ that day. Several days later, Ha Jimmy says, Saigon was overrun by the communists. Because he had friends among the American forces, Ha Jimmy was able to find escape, and came to America. Most of his friends and fellow churchgoers were not so fortunate. He believes that most of them were probably killed when the Communists overthrew Saigon. Ha Jimmy was a quiet and assuming man, not given to exaggeration, so his story made a deep impression on me. I've always wondered whether, if placed in his circumstance, you and I might experience something similar. A life lived on the knife's edge of survival is a life where there are fewer obstacles to seeing God intervene in dramatic ways. I recently promised that I would start writing down here some of the stories that I share with Pulse, our church's young adults group, that revolve around my experiences with prayer and God's miraculous provision during the years. Today I want to share what is one of my earliest and most dramatic answers to prayer that I have witnessed. I think in many ways it is a perfect example of how God loves to work in ways that "confound the wise." A "maxi taxi" minibus in Port of Spain, Trinidad. In the summer of 1978, I traveled with more than 90 other students of Biola University on a short-term missions trip to the island of Trinidad. Trinidad is the southernmost of the Caribbean Islands, lying a mere 10 miles off the northeastern coast of Venezuela. The project, the brainchild of my friend, missions pastor Dan Crane, was called "Operation Jabez" and has been written about in Bruce Wilkinson's popular book, "The Prayer of Jabez: Breaking Through to the Blessed Life." Trinidad shares government with the isle just north of it, Tobago, which is (with the exception of Barbados) the easternmost of the Caribbean Islands. We spent one lovely week "debriefing" from our two-month visit to Trinidad, on Tobago. In Trinidad, we broke into teams of about 4 students each in order to take on different assignments and minister in different parts of the island. We were there to help the church do evangelism and outreach. I had leadership of a team including three other students and we were stationed in Trinidad's capital and largest city, Port of Spain. Halfway into our stay, we learned that some of the teams were assisting the churches to which they were assigned in organizing an evangelistic tent crusade, "somewhere up in the mountains." Due to insufficient means of communication (no cellphones in those days, and no landlines where we were staying) we had no more information than this exactly where the crusade was to be held. But we really wanted to attend, and upon spending some time praying about it on the Saturday morning when the meetings were to start, felt the Lord urging us to strike out in faith and to try to find the meeting place. This was not as simple as it sounds. 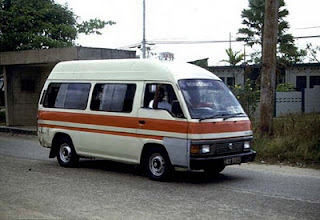 We were on foot, the island is large (with mountains covering a swatch of the northern portion about 10 miles deep and 40 miles wide), and our only possibility for finding the meeting was hailing one of the many privately-owned taxis that prowl the streets of Port of Spain. So we hailed the first taxi we saw (which didn't take long, since at least every other car is a taxi) and the 4 of us climbed in. Trinidad is a mix of two predominant cultures: Muslims (primarily from northern Africa) and Hindus (primarily from India and thereabouts). Our taxi driver was Muslim and seemed glad for a fare that included four young Americans. "Where to this fine day?" he asked us happily. Everyone settled in, then they all looked at me expectantly. "Well, that's a good question," I admitted. "Here's the thing. We're headed for a meeting being hosted by Christian churches, to worship God and to hear more about Jesus. But we have no idea exactly where it is, we were just told it was in a large tent somewhere up in the mountains. We were hoping you might have an idea." He gave us the strange look we certainly deserved, and laughed. "I haven't heard of such a thing. And I have no idea where it might be. There are hundreds of square miles of mountains here, and many possible roads which cross them. We could drive several days and we still might not find it." He looked back at me and waited. "Well," I told him with a shrug, "the four of us prayed about it this morning. We really felt like God wanted us to go, and we believe you are the one to take us there. We will leave it up to your best judgment where to drive, and we will pay whatever it is worth. And we won't keep you for several days. If we can't find it by this afternoon, we will have you return us here. But we do feel like God will help us to find it ... through you." He laughed again, and shrugged. "If you're paying, I'm driving!" he intoned cheerfully. And with that, we pulled out into traffic, heading east. Within 5 minutes, we came to our first opportunity to turn north, and into the mountains. "Turn here?" he asked. We merely shrugged. "It's completely up to you. We will agree to go whichever way you feel is right." He shrugged, wrestled for a moment with the decision, then bypassed the turn and continued driving east. Another 10 minutes or so, and we came to another crossroads, with another road snaking north into the mountains. "Here?" he asked again. We shrugged. "Up to you!" He laughed and made a decision again, and continued east. Despite the uncertainty, we were enjoying the journey, and enjoying getting to know our jovial driver. We sang together, and prayed, and remarked on the beauty of the countryside and its lovely people. Another 15 or 20 minutes later, there came another opportunity to turn north. This time he took the initiative. "Okay," he said. "Into the mountains we go. I don't think this route will take us through to the other side, so if it's not here somewhere, we will need to turn back." "Fine with us!" we told him. "We are trusting that God will work through you." He just laughed and shook his head. "Wait until I tell my wife about this one!" he said. We all agreed -- it would be interesting. We continued north on the windy mountain road. There were a few opportunities for turns, and he randomly selected this direction or that, mostly just going straight ahead. The road wound and narrowed up the mountains. Eventually the road neared to an end. "I think this is as far as it goes," he told us. We turned a final corner ... and immediately ahead of us, in the center of the small town at the end of the road, was a large white tent. "This is it! We're here!" we all shouted excitedly, hugging one another. But our driver said nothing -- he just sat and stared at that large, white tent. His eyes went wide, and he had paled visibly. The four of us laughed, and slapped him playfully on the back. "Wonderful!" we said. "We knew you could do it! Praise God, look how He worked through you to help us! "We may be here for a few hours. Will you be able to take us back, or shall we call another taxi? We will pay for your time if you are willing to wait." He shook his head no, and so I handed him a generous amount of cash and we began to climb out, thinking he was ready to leave. But suddenly he thrust the cash back at me, and spoke: "Excuse me! Excuse me!" he stammered. "What kind of meeting did you say this is?" "Well," I told him, "it is a meeting about Jesus Christ, and how to become a child of God. There is a teacher here who will share from the Bible." "I want to come find out about this Jesus," he told me, turning the key and shutting off the engine decisively. "May I come with you?" We all surrounded him excitedly. "Of course! You are our guest." So he walked with us into the meeting, where they had already commenced worship. We enjoyed at least an hour of singing, and prayer, and an excellent message by a local evangelist. He sat silently and soaked it all in, but made no move when the evangelist invited people forward to receive Christ. After the meeting was dismissed, we all returned with him to his taxi. After climbing in, our driver merely sat behind the wheel, keys in hand, thoughtful, making no move to start the engine again. "So," I asked him, "what did you think about that?" For a few moments longer he sat in silence, as if wrestling with some inner struggle. Then a look of resolution came to his face, and he turned toward the four of us. "I think I need this Jesus to forgive me of my sins," he told us. "How can I do that?" So we prayed with him, right there in the taxi, and our newfound brother gladly accepted Christ into his heart. Then, all the way home, we shared together with him about the Christian life and about how God speaks to us through His word. We prayed and sang some more, and rejoiced with him. He invited us to come to his home in Port of Spain, every Saturday thence, for Bible study and prayer. And we continued, while we remained there, to seek to help him get to know Jesus better. I know that he was sharing what he was learning with his local imam, who we frequently saw lurking about the bushes near his house while we were studying. After we left, each week, the imam would scurry in. I wish I had been privy to their conversation. When we left the island, we committed our friend into the hands of the local Christian church we worked with there, a small group of believers who (literally) met in a chicken coop! (I preached there, our first Sunday, for an hour, amidst crowing roosters!) We continued to pray for him (and still do). I assume he has by now retired from his taxi business, and am hoping and praying that he and his family (and perhaps his grandchildren!) are all enjoying the abundant life in Christ. This is just one of several firsthand experiences in my life of the miraculous power of prayer. I also have a great deal of secondhand testimony, from people I love and trust, of similar miracles wrought by the power of Christ. In my next blog post I will tell about meeting Ha Jimmy, who served as a commander among the Hmong mountain people in Vietnam's wild northern forests, fighting against the communists. Ha Jimmy told me of an incredible miracle that he had witnessed, firsthand, in the final days before Phnom Penh fell to the Viet Cong. So stay tuned! I find paradoxes interesting. And here's one that is VERY interesting: There are certain things that have the feel of being cool, hip, "with it" -- but these are things that according to the writers of the Bible really are foolish. For instance, atheists in our society are presented as cool, smart, and "hip" ...but the Bible says: "The fool says in his heart: 'There is no God.'" There are other things that seem foolish to us. Last weekend I flew on planes from Seattle to Newark, Newark to Pittsburgh, Pittsburgh to Denver, then Denver back to Seattle. When I fly I take one small paperback so I'll have something to read below 10,000 feet while we're not allowed to use personal electronics. I took a small book by John Piper called "Fifty Reasons Why Jesus Came To Die." Each of the 50 reasons are decorated with a large cross and emblazoned in large font, such as: "To Absorb the Wrath of God." As usual I sat in the "B" seat between two other passengers. As I turned the pages of this small book I could feel their eyes upon me, no doubt evaluating what kind of grown man would be entertaining such "religious" silliness. I found myself fighting embarrassment despite knowing better. And thinking about 1 Corinthians 1:18: "For the message of the cross is foolishness to those who are perishing, but to us who are being saved it is the power of God." I forced myself to keep the booklet open and ignore the stares. I think prayer falls into that exact same category. While most people believe in it and most people have done it, at one time or another, it still seems silly or foolish to see a grown person talking to an invisible deity. In large public events such as presidential inaugurations we embellish such moments with pomp and eloquence, in an apparent attempt to give the activity some dignity which it might otherwise seem to lack. "Father, I thank you that you have heard me. I knew that you always hear me, but I said this for the benefit of the people standing here, that they may believe that you sent me." It is simple, trusting, talking to His Father about those who are standing nearby and listening. If ever there would be a time for pomp and eloquence, one would think it was when you needed to raise someone from the dead. But not here. Jesus ends His prayer with those words, then cries out simply: "Lazarus -- come forth!" My most effective prayers have been like that. One or two desperate, very ineloquent sentences. 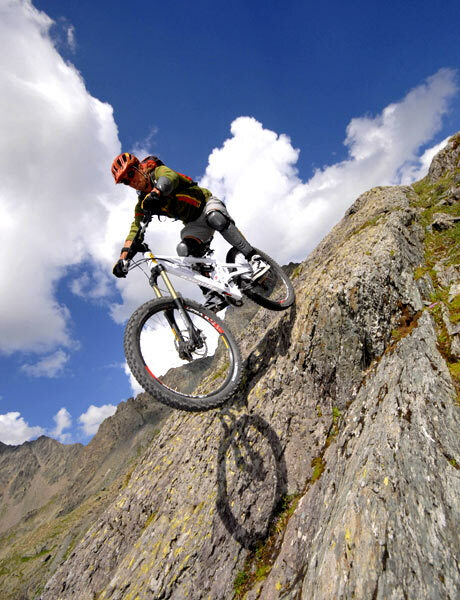 In 2003 I spent the morning mountainbiking on the Angeles Crest trail high above the Los Angeles basin. I was utterly alone all morning, and loving it. I had a cellphone with me, but each time I had checked it, it had registered 0 bars. No reception whatsoever. After three hours ascending slowly to a peak above what in wintertime is a popular ski resort, and taking in the fabulous views while I rested, I started zooming back down the trail toward home. But, perhaps half of the way down, I got careless. The singlewide trail had turned to asphalt, but it was rough. I came flying around a blind corner, doing maybe 25 mph, a severe drop on the left side and rock wall on the right, and suddenly saw in front of me a washout. I must have crossed it on my slow journey upward, but totally forgot about it. A more experienced mountain biker would have known enough to power through the washout, front wheel held high, but I panicked and attempted to brake. Without anywhere near enough room to stop, I plunged into the washout. At that point I tried to jump it, but my front wheel caught the far edge and I was flipped onto my face on the far side. As I lay there, trying to pick myself up, I knew I was badly hurt. I had broken five upper teeth and torn an enormous gash across my face. I couldn't see out of my right eye. My left cheek hung flapping open, molars exposed on that side. In blazing pain, I could feel bone grating on bone somewhere on the right side of my face. (I thought my jaw was broken; later on it turned out to be only my cheekbone.) 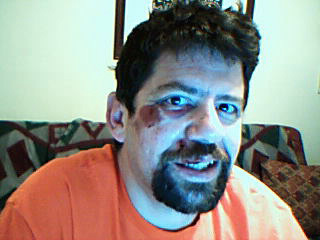 My helmet above my forehead was bashed in -- I'm sure it saved my life. Blood was streaming down my neck onto my shirt, and when I looked down I saw it was also pouring down my leg from a mangled kneecap. My bike was completely unrideable, and I had no idea how far from help I might be, but I knew it was a long walk. But I really had nothing else to do, so eventually I found the strength to pick up my bike and started hobbling down the trail with it. Something like 20 minutes later, the world started to spin and I knew I couldn't continue. I lay my bike down and sat down by the side of the trail. I looked at my phone for the hundredth time since the accident -- still no bars. Then I thought, foolishly, Why hadn't I prayed yet? If ever there was a time for it, this was it. By this time the realization that I could continue no further was heavy upon me. Without help I really might die there. So, no eloquence in me, I lifted my bloody face painfully skyward and cried out, "Jesus, please help me! I don't want to die here!" That was it -- all I had. I lowered my face and looked at my phone again through my working left eye. I saw the signal strength indicator was still at 0 bars. But then, as I watched, it suddenly but steadily climbed through all the options -- 0, 1, 2, 3, 4, 5. Full strength! It was as if Someone had simply thrown a switch. I dialed 9-1-1 and counted the rings ... 20 of them. Then a man's voice answered: "9-1-1. What's your emergency?" I explained my predicament as he listened. When I told him I was on the Angeles Crest Trail, he stopped me. "Angeles Crest? Where's that? Is that anywhere near Los Angeles?" "Yes," I said, a chill running down my spine. "I'm northeast of Los Angeles. But I'm not sure how far. Maybe 50 miles." "What county?" he asked, sounding incredulous. "I'm not sure of that either," I confessed. "It's either San Bernardino or Los Angeles county. I think I'm somewhere near the border between the two." "Wow," he exclaimed. "I'm in San Diego. I don't think I've ever received a 9-1-1 call from anyone outside this county. But don't worry, we'll get you help. I'll dispatch a helicopter from San Diego right now, then we'll start calling L.A. and San Bernardino County services and see who is closest to you." We were soon joined by a dispatcher from L.A. County who transferred us to someone in the mountains near the Angeles Crest Trail. "Yes," he told me, "I think I know approximately where you are, or at least what trail you are on. 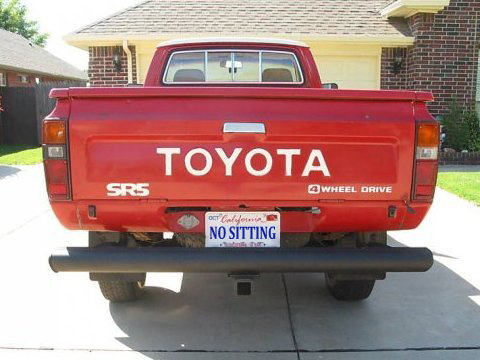 Sit tight and we'll send a rescue unit your direction." The dispatcher from San Diego came back on. "Okay, Larry," he said, "help is on the way. I'm going to stay right here with you -- so don't hang up the phone." "I won't!" I assured him. But at that very moment, the line went dead. I looked down at the signal strength indicator. It was on its way back down to 0 -- where it stayed. At first I felt another chill of fear run down my spine. Did they really know where I was? Could they find me in time? But then I realized, I wasn't asking the right question. Obviously, God knew where I was! Was I going to trust Him? Twenty or 30 minutes later, I saw a cloud of dust rising, way down the mountain. Then the flashing lights of a rescue vehicle, bumping up the trail toward me. I was found! The rest of the day and into that evening I spent in an emergency room in Fontana, where I was x-rayed, cleaned up, and sewn up. The next day, miserably sore but happy to be alive, I was able to attend my daughter's orientation at Pt. Loma University in San Diego. Healing up nicely, a week after the accident. This is a dramatic example, but it's how prayer has been for me. (I'll share more examples in subsequent posts, so stay tuned!) God doesn't always answer the way I want, but He's always there, always meets me at my point of need. Prayer is therefore, as seemingly foolish as it might be, the most powerful and effective thing in my life. So then, why don't I do it more? Obviously, those occasional, serious, dramatic needs are great times to pray. It should be our first instinct. (I still am ashamed that it took me 20 minutes to even get the notion to pray.) And I know God wants us to pray over the simple things as well ... a lost contact lens, an interpersonal frustration, a fear that holds us back. A temptation that we struggle with. 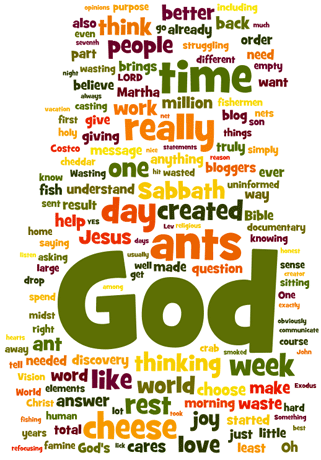 After all, what's small to God? (Everything!) What's big to Him? (Nothing!) We are all on a very level playing field before God. As I've studied Scripture and watched how Christ prayed, I've realized the main power in prayer is not in having some 9-1-1 dispatcher in the sky. It's simply in having an omnipotent, all-knowing, and all-caring Father we can talk with, One who desires us to know one another better. It's building the relationship. So, I am trying my best to do that every day, to spend some time praying and just expressing my heart, as ineloquently as it may be, to my heavenly Father. Will you join me? 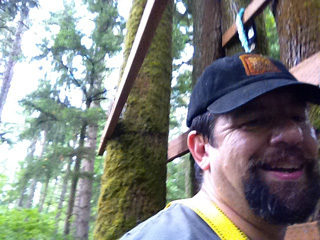 Okay, here I am, a 54-year-old boy, and I'm building a treehouse. Before I tell you why (and exactly what I am planning), I'm sure you are thinking, "That's silly. A treehouse? You are a grown man. You have no spare time. You are likely to fall out. And if you do, you will surely break something that can't be fixed. What are you thinking?" Well, actually, that's what I have been thinking ... every time I work on it. And yet, still I feel compelled to continue. My tree house is out in the forest (from its perch, 20 feet off the forest floor, you can't see a single civilized thing). I am building it much more solidly than I ever built treehouses as a kid (buying real pressure-treated lumber instead of scavenging half-rotten boards from the dump; using real galvanized nails and joist hangers rather than tying things together with spare pieces of old rope and wire; etc.) I even invested in a climbing harness, so that in case I do take a tumble that would otherwise be 20 feet, I will merely injure myself by falling 6 feet and not (hopefully) kill myself. So, why am I building it? My first excuses sounded like good ones: I have a granddaughter (almost a year old) ... she is going to want a treehouse to play in, eventually, right? Grandpa will need to have something good to offer to compete with Grandma's baking skills. I work with college-aged students. All the guys in the group are very excited about this project. (A place to get away, "no girls allowed," and talk about what really matters. Plus there's the zip line.) And then there is my nephew, Kyle, who has been helping me build. It's a great opportunity to get to hang out with him, he's a fun guy. But even if you take away these "excuses" ... would I stop building it? No. So now the truth comes out: It's also for me. And the really crazy thing is, I'm terrified of heights. I just think about being that high, and my palms sweat. The climbing harness helps a bit ... I know I can trust it. But still, every time I get up there, hammer in hand, I can't stop my hands from shaking, and it takes an effort of will to concentrate on the task at hand. We'll see if this therapy works!